It will run with red and white wine at weekends and on bank holidays, carrying on the tradition started by Henry VIII. The design was based on the Field of the Cloth of Gold painting displayed at the palace. It shows Henry VIII meeting French King Francis I, and depicts two large wine fountains built for the occasion. 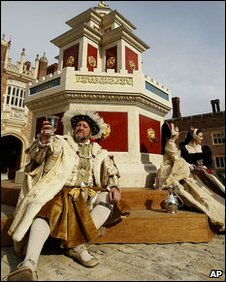 Dr Kent Rawlinson, curator of historic buildings at Hampton Court Palace, said: "Hampton Court was a pleasure palace for Henry VIII, where guests were entertained with spectacular revels and festivities, and wine and beer were drunk in enormous quantities, as evidenced by the great cellars that still survive here." Historians believe it was also common for wine to run through public fountains during festivals and celebrations, such as those to welcome a new monarch into London. The fountain, found in the palace's largest inner courtyard, Base Court, will serve wine, costing £3.50 a glass, from 1 May.